Indigenous peoples and local communities often ask what their rights are at the international level. The answer to this crucial question is complicated for several reasons, including the fact that the provisions containing the rights are spread across a wide range of international instruments, each with its own particular focus. As a result, Indigenous peoples and local communities are denied an easily accessible means of learning about the full spectrum of their rights relating to issues such as developments on their territories, lands and waters and the use of their natural resources and knowledge. To address this deficiency, and to help answer to the question posed above, Natural Justice has produced The Living Convention. 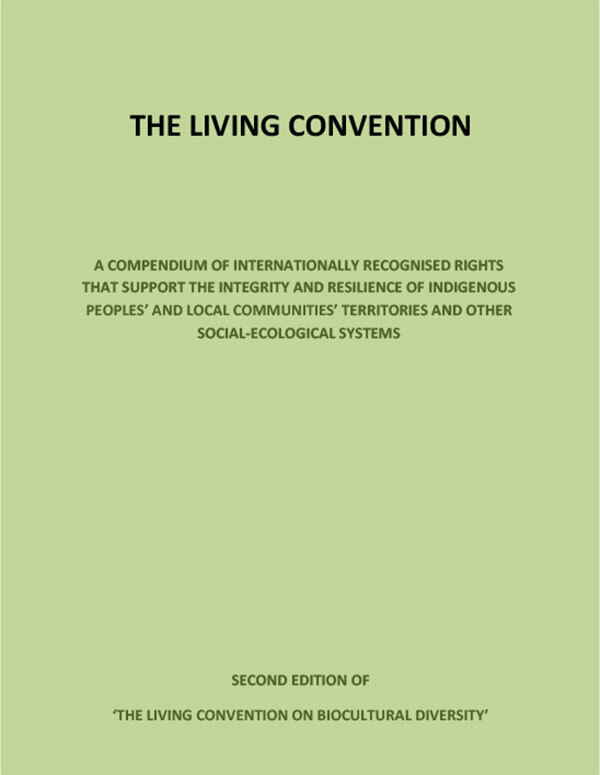 Using an integrated rights approach, the Living Convention provides a range of the most important provisions relating to the linkages between Indigenous peoples and local communities and, among other things, their territories, lands, natural resources, and knowledge systems. It sets them out in an ordered manner, grouping similar provisions under the same heading to enable the reader to quickly assess the extent of international law relating to specific issues. In this way, the Living Convention aims to democratise international law by providing a straightforward resource for Indigenous peoples, local communities, and their supporting organisations to refer to when seeking to understand their international rights. Part I sets out the rationale and methodology of the research undertaken to develop the compendium in Part II. Part II contains a compendium of internationally recognised rights that support the integrity and resilience of Indigenous peoples’ and local communities’ territories and other social-ecological systems. Part III sets out a number of key questions concerning, for example, the utility of integrated rights approaches, how international law can be reformed, and how national governments can better uphold their international commitments. It then suggests initial activities that could further deepen the analysis and ways to address the current weaknesses in the development and implementation of international law. The Living Convention also includes annexes, which (among other things): detail the instruments reviewed, included, and excluded from the Compendium; provide a list of relevant international and regional judgments; and list a number of Indigenous peoples’ declarations. This second edition of the Living Convention represents a further step in an ongoing process of ensuring that international law properly fulfils its intended purpose. We invite you to peer-review the publication and to work with us and others to improve it and take it forward in practice. The second edition of the Living Convention is available for download below in English (3.5 MB) and Spanish (3.9 MB). Please contact us at harry(at)naturaljustice.org if you have any questions or would like to discuss further.